You need to start a backup but you’re miles away from your Mac? Much as you can control another Mac using Leopard’s Screen Sharing feature, you can control a Mac from your iPhone. The means for doing so is a VNC (Virtual Network Computing) client such as ReadPixel’s $7 RemoteTap ( ). 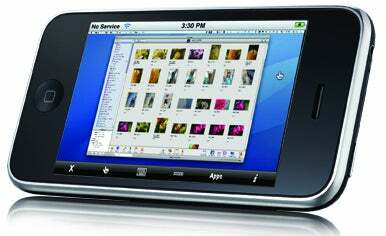 A VNC client places a tiny version of a Mac’s display on the iPhone’s screen, which you can control by dragging and tapping. 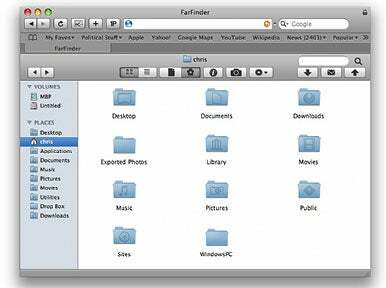 FarFinder lets you browse your Mac's folders via the Web. If you don’t need to control your Mac, but you do want to be able to grab files from it, Flying Mac’s $35 FarFinder is a better alternative to a VNC client. FarFinder lets you use a Web browser (a free iPhone application awaits Apple approval) to navigate your Mac in a Finder-like view-far easier than trying to fit your Mac’s entire screen on your iPhone’s tiny display. You can e-mail files to yourself, or in some cases even view files (images and PDFs, for example) in the browser. But keep in mind that your computer has to be turned on for this to work. To move files from your Mac to your iPhone over a local wireless network, try Magnetism Studios’ $5 FileMagnet ( ). FileMagnet will also let you view iPhone-compatible files-though you can’t edit them. Keep in mind that for these files to be viewable on the iPhone, their names must have the appropriate extension-.jpg or .doc, for example. 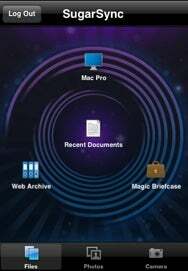 Sync your files to SugarSync's servers and they're available to your iPhone and other computers. If you want to share a document with other Macs as well as with your iPhone, or if you like the concept of instantaneous access, turn your attention to Sharpcast’s SugarSync. The online service expands the concept of push data-Apple’s MobileMe, for example, will “push” contacts, calendars, and e-mail to your iPhone-to include documents and media files. You simply upload files to SugarSync’s servers via the SugarSync Manager application installed on your Mac, and those files become available to other computers and mobile devices such as the iPhone and iPod touch. 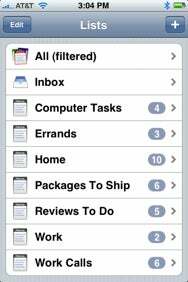 Install the free SugarSync iPhone app and you have nearly immediate access to those files. You can view iPhone-compatible files as well as stream MP3 and AAC audio files. Pricing starts at 10GB of storage for about $2.50 a month. Want to turn the tables and copy files from your iPhone-including call logs, SMS messages, media files, and notes? Ecamm Network’s $20 PhoneView ( ) is the way to do this. When you plug your iPhone into your Mac, PhoneView launches and lets you browse some of the contents of your phone. Find an item you want and click on Copy From iPhone to move it to your Mac. This is handy for restoring your music files if a dead hard drive kills your iTunes library. The program also lets you create folders on the iPhone for storing your files (you can’t access these files on the iPhone-they’re for the purpose of storage only). With Google's Calaboration tool, a Google calendar, and iCal, you can sync a shared calendar with multiple Macs and iPhones. Keeping events in sync between multiple people using multiple Macs and iPhones is no easy feat. The secret is to create an iCal-compatible Google calendar. To do this, set up a Google calendar and use the online tools to share it with your family members or coworkers. 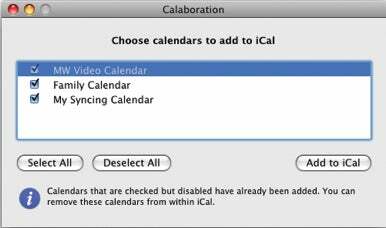 On each Mac that needs access to the calendar, download the free Google Calaboration-yes, it’s spelled that way-and select the Google calendars you wish to synchronize with iCal. Now when you add or edit events with this calendar in either iCal or Google Calendar, those events are updated for everyone subscribed to it. To keep the iPhones in sync, simply configure them in iTunes to sync to this iCal calendar. If you keep your contacts, e-mail, and calendars in Google’s apps and want that data pushed to your iPhone, check out Google Sync. Once you set up a Google Sync account, changes to your Google contacts, calendars, and e-mail will immediately sync with your iPhone and your computer. What’s more, the service is free-unlike the $99 MobileMe account that Apple requires for its push service. At the moment, Apple doesn't offer any way of syncing data from the iPhone’s Notes app or to-dos from iCal on the Mac. Although Apple has promised to offer a way to sync notes in the upcoming iPhone 3.0 software update (no word yet on to-dos), there's no need to wait. If you’ve been as frustrated by this forehead-slappingly-obvious omission as we are, forget iCal and Notes; the key to this particular magic trick lies elsewhere. Keep It Online As long as you usually have a good Internet connection, one workable alternative to syncing is to use an online service. RememberTheMilk, Toodledo, and Google’s Gmail offer free online to-do lists you can access from Safari on your iPhone or from any browser on your Mac. (The first two sites also support notes.) To set this up in Gmail, go to your Gmail settings screen, click on the Labs tab, and enable Tasks. Tasks will appear in the normal Gmail screen on your Mac; to view them on your iPhone, browse to http://gmail.com/tasks. Sync via the Web If you prefer to keep your notes and to-dos in an iPhone app that’s accessible even when you’re offline, you have several options. Appigo’s $10 Todo ( ) and Toodledo’s own $4 iPhone app both offer powerful to-do-list features-including notes-and sync with Toodledo.com. If tasks are less important to you, you can save money by going with Appigo’s $5 Notebook, which works similarly but focuses on notes. Unfortunately, none of these services syncs with iCal, so you’ll need to manage your to-do lists via the service’s Web site while at your Mac. Skip the Web To forego a Web browser altogether, you’ll need a program that has both iPhone and Mac versions. Ross Tulloch’s $4 SyncBook syncs notes between the two platforms. On the Mac, notes appear as text files that you can edit in TextEdit. For advanced task- and project-management, Cultured Code’s Things (iPhone version [ ], $10; Mac version, $50) is an attractive and easy-to-use program that includes schedules, priorities, tags, and notes; the iPhone and Mac versions automatically sync over your local network. Fool the iPhone If you’re determined to sync notes without any outside help, try disguising your notes as something else. In Address Book, create a new contact and place your text in the contact’s Notes field. Mark it as a business and give it a useful name. Address Book on your Mac will reflect changes you make on the iPhone, and vice versa. The downside, of course, is that you have to manage your notes using contacts, but with some clever naming you can keep notes grouped together at the beginning or end of your contacts list.